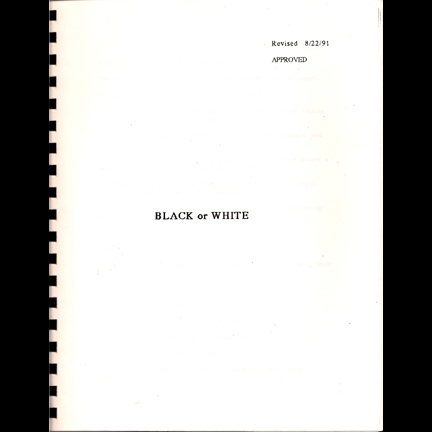 This spiral bound soft-cover production book from Propaganda Films and MJJ Productions was used for Michael Jackson’s groundbreaking video/short film “Black or White”. 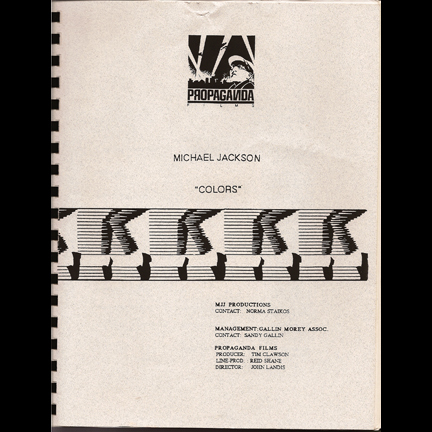 Under the project working title “Colors”, the booklet includes a full script, shooting schedule, photocopied storyboards (including those for the controversial and often deleted “Panther” sequence), contact and crew lists, location list and map, and calendar of events for primary filming. 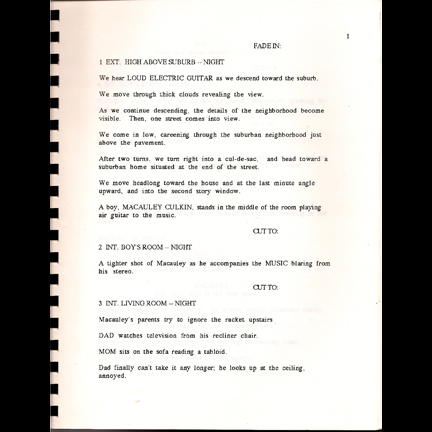 Loose pages inserted into the booklet include crew Call Sheets, additional pick-up shot schedule, and a folder containing costume notes for the Russian dancers seen in the video. 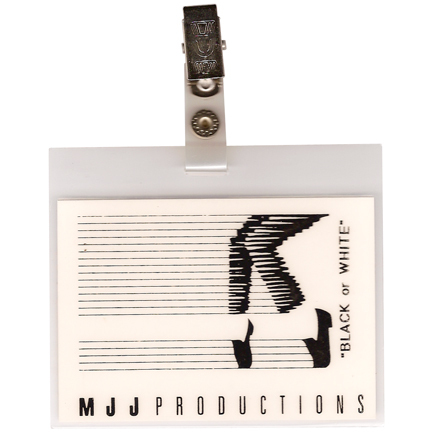 A laminated badge with “MJJ Productions, ‘Black or White’” printed on one side, and “Property of MJJ Productions” printed on the reverse also accompanies this extremely rare pop culture artifact. “Black or White” was the number one hit single off of Michael Jackson’s “Dangerous” album released in October of 1991. The song was one of the most popular hits of the early nineties and went to number one on both the US Billboard Hot 100 and the UK Singles Chart, as well as topping charts in eighteen other countries. The video for “Black or White” is considered a historical musical landmark for several reasons. 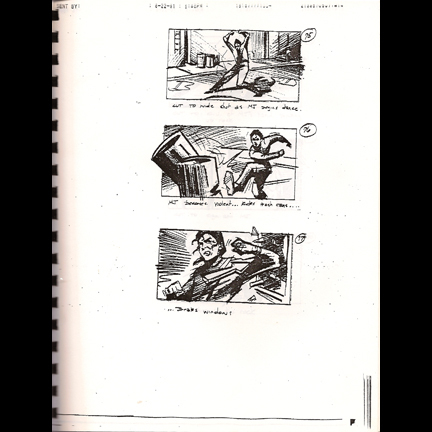 The nearly eight minute long original cinematic production was first seen on November 14, 1991 as a heavily promoted televised world premiere that was directed by John Landis, who had previously worked with Jackson on the “Thriller” video. 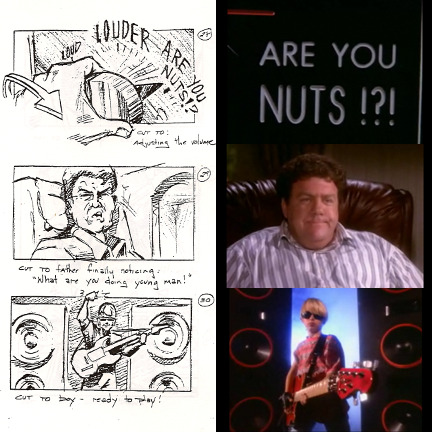 The cast included high profile celebrity actors such as Macaulay Culkin, Tess Harper, George Wendt, and Tyra Banks, and the opening introduction to the video and primary song riff were both performed by guitarist Slash from Guns And Roses. It also featured one of the earliest examples of “Morphing” digital effects, which was considered groundbreaking at the time. 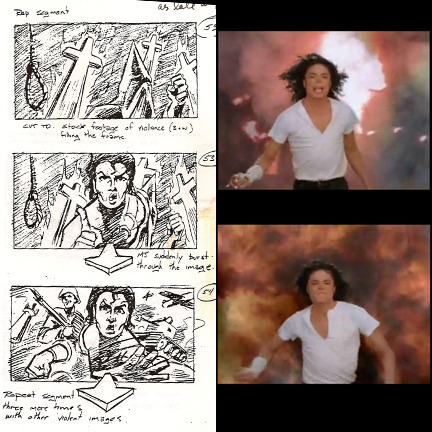 While the song and video primarily promoted racial harmony, the original version of the video stirred considerable controversy due to an extended scene near the end where Jackson appears as a black panther before morphing back into human form. He then goes on a rampage of vandalism, smashing car and storefront windows and causing a building to explode. 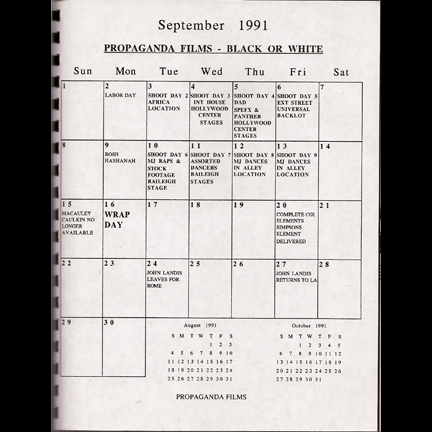 Because of the controversy, MTV and other music video networks removed the last four minutes of the video in subsequent broadcasts and the original uncut version is still rarely seen to this day. This item is strictly being sold as a collectible piece of memorabilia. No rights are granted, impressed or implied. 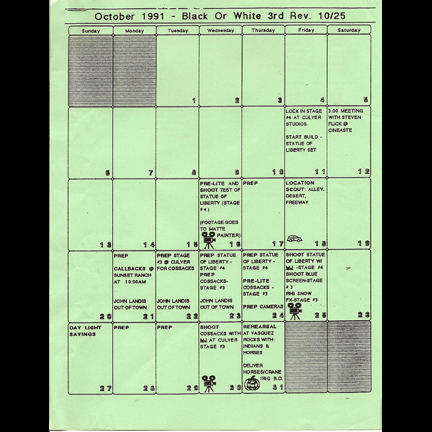 Replication or use of this booklet and artwork are not permitted.